Top image shows 3 Geckos installed. Board will support 4 drives directly. The PMDX-132 is now a legacy product and is only available as a special order item. Our remaining stock has been exhausted and there is now a minimum order quantity of 10 pieces in order for us to build more. Price and delivery time to be quoted upon request. We recommend that you consider using a PMDX-126 and a PMDX-134 as an alternate solution. This offers more functions but is not a direct mechanical replacement. A ribbon cable such as the PMDX-HDR26Ribbon-18 is also needed to connect the PMDX-134 to the PMDX-126. 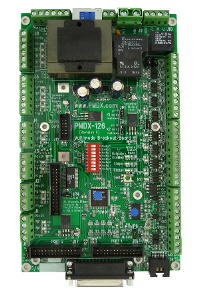 The PMDX-132 is a motion control breakout board for interfacing with the parallel port of an IBM-PC style computer. 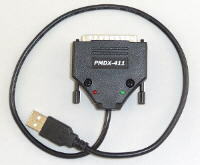 Those interested in the PMDX-132 may also wish to consider the PMDX-126 connected to a PMDX-134 by a PMDX-HDR26Ribbon cable for similar ease of wiring, but more features. Four jumpers to set "common" as +5 or Ground for each drive independently. You can mix drive types. Supports G201, G201X, G202, G210, G210X, G212, G203V and G213V stepper motor drivers. It does NOT support the G250 or G251, nor any of the servo drivers. Supports standard IEEE-1284 Centronics style printer cable for connection to PC. The 26 pin ribbon cable port also allows direct connection to compatible pulse generator boards like the SmoothStepper. Supports a "charge pump" signal to inhibit outputs when the MACH software is not running. All I/O connections are made via wire clamp screw terminal strips. PMDX supplies new 4 position connectors for the stepper motors and the connectors removed from the Gecko drivers are reused as the I/O connectors of the PMDX-132. Auxiliary +5 volt DC output available to power sensors such as the PMDX-170 and PMDX-171 sensors. 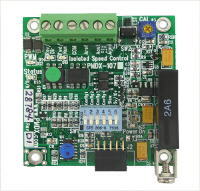 ** Geckodrive, Inc. the maker of the Gecko stepper motor drives is a separate company from PMDX and is not responsible for the statements made on this web site or in other PMDX documents. Note: The step and direction signals used to run this board as a real time CNC device require precise timing. These signals are normally provided by a personal computer motherboard with an onboard parallel port, a parallel port interface card plugged into a motherboard with ISA, PCI, or PCI-Express slots, or by an external device such as the SmoothStepper. You cannot use a USB to printer adapter because it will alter critical timing of CNC control signals. Laptop computers, even those with parallel port interfaces, are not recommended as CNC control computers due to design features that can alter critical timing. If you must use a laptop be prepared to deal with these design issues and/or plan on using an external pulse generating device such as the SmoothStepper. Download the manual in PDF format here (revision 1.2, 500 KB). The PMDX-132 is now a legacy product for special order only.